On 25 June 2018 staff members, academics and students from the North-West University (NWU) attended the seventh public lecture within the NWU Research and Innovation Seminar Series. 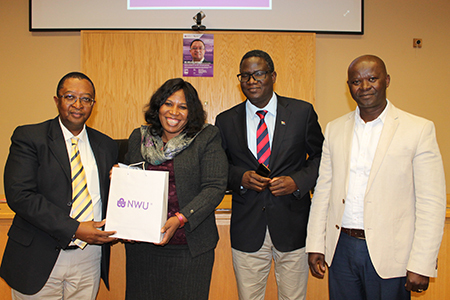 Prof Refilwe Phaswana-Mafuya, the NWU’s deputy vice-chancellor for research and innovation, invited Dr Molapo Qhobela, CEO of the National Research Foundation (NRF) to present a lecture titled “Support for South African researchers in a resource constrained environment”. According to Prof Phaswana-Mafuya the lecture by Dr Qhobela was long awaited and much needed, since it is in line with the NWU’s 2015-2025 intensification of research and innovation goal, which aims to bring socio-economic solutions to South Africans. She added that the public lecture would also give members of the NWU the opportunity to latch on to the great opportunities that the NRF is offering. Dr Qhobela gave an informative talk on the foundation’s mandate, profile, and who it funds. According to Dr Qhobela the NRF’s main objective is to contribute to the country’s national development by executing four key objectives. The foundation aims to support and promote research in human capital development; develop, support and maintain national research facilities; support and promote public awareness of and engagement with science; and promote the development and maintenance of the national science system and supporting government priorities. The NRF and the NWU have had a long-standing relationship that has been beneficial to both parties over the years. Dr Qhobela indicated that between the period 2012 to 2016 the number of NWU researchers who have been funded by the foundation had been on a gradual increase. During 2017 the NRF received 1 062 grant applications from academics at the NWU, and only 142 applications were approved for funding. Dr Qhobela stressed the need for high potential and emerging researchers to apply for funding, as this will enable them to become established. "Our participation in the research excellence programmes of the NRF continues to grow with impressive success rate,” said Dr Sibo Sowazi, director for Research Support at the NWU. “The NWU is one of the only six institutions nationally that host more than 200 NRF-rated researchers. He added that the number of DST/NRF SARChI Chairs has grown from three in 2012 to eight in 2018, generating external research income of around R300 million over a 15-year period, as each chair is funded over 15 years at between R1,6 million and R2,6 million per year. From left are Dr Molapo Qhobela, CEO of the National Research Foundation, Prof Refilwe Phaswana-Mafuya, NWU DVC: Research and Innovation, Dr Ndanduleni Nthambeleni, NRF Executive Director: Grants Management and Systems Administration, and Dr Sibo Sowazi, Director: Research Support at the NWU.